Hi there, everybody! Happy Month of May - and here we are at the SUPER FUN time of the month when it's time for the Paper Sweeties New Release Party. Today is Day #1 of 3, and that means there will be LOTS of great inspiration today, tomorrow (Release Day), and also on Wednesday. For today, it's just a "sneak peek", but as of tomorrow; you can purchase these FABULOUS new sets for yourself. 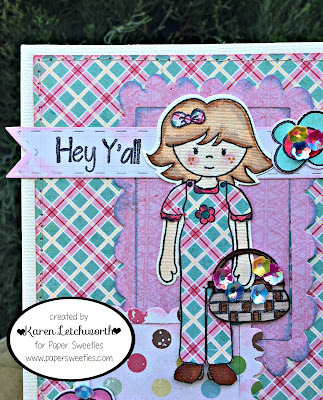 The first new set I'm showcasing today is a great new sentiment set called "Hey Y'all Stamp Set". But first.....have you met Abigail? Or the rest of the "Sweeties".....Jake, Emma, Sophie or Madison? 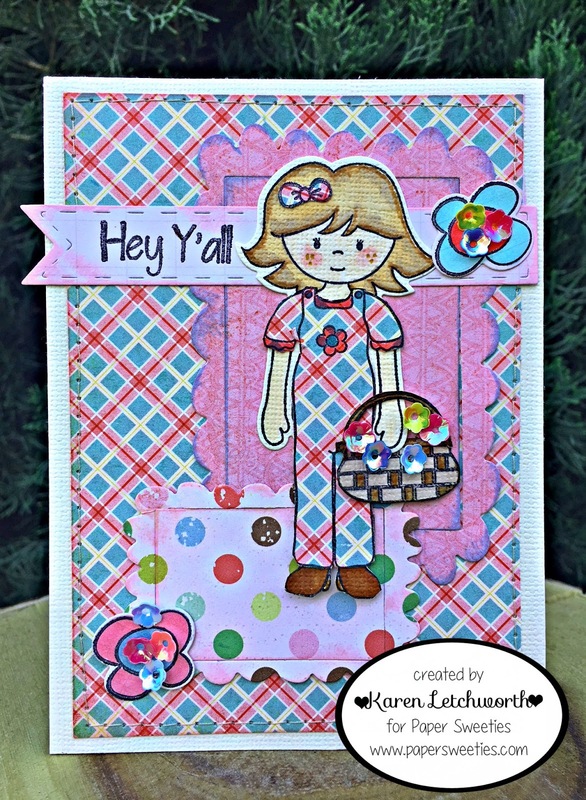 Well, if you haven't met them yet.....you will most definitely want to; because they're the sweetest, cutest little people (paper doll style stamps) that you'll ever meet; and they're just waiting to meet YOU! 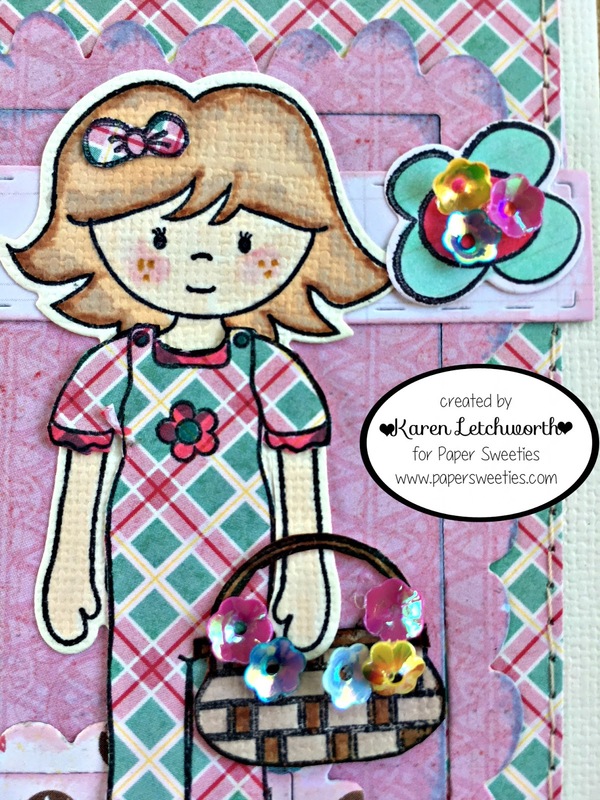 The Paper Sweeties Shop also carries oodles of ADORABLE stamp sets that include outfits for them along with sentiments and cute little extras in each lovely stamp set. Oh my! If you're not yet familiar, please do stop by and meet "The Sweeties" and see ALL there is to help you make ADORABLE cards, planners and more. There's luscious Seam Binding, sweet flower-shaped (cupped) Sequins in more than 21 gorgeous colors, and so many other WONDERFUL products. This little "Sweetie" is Abigail, so if this is your first time meeting her, I hope you like her as much as I do. I stamped Abigail in black ink and then cut her using the coordinating Abigail Sweet Cut. 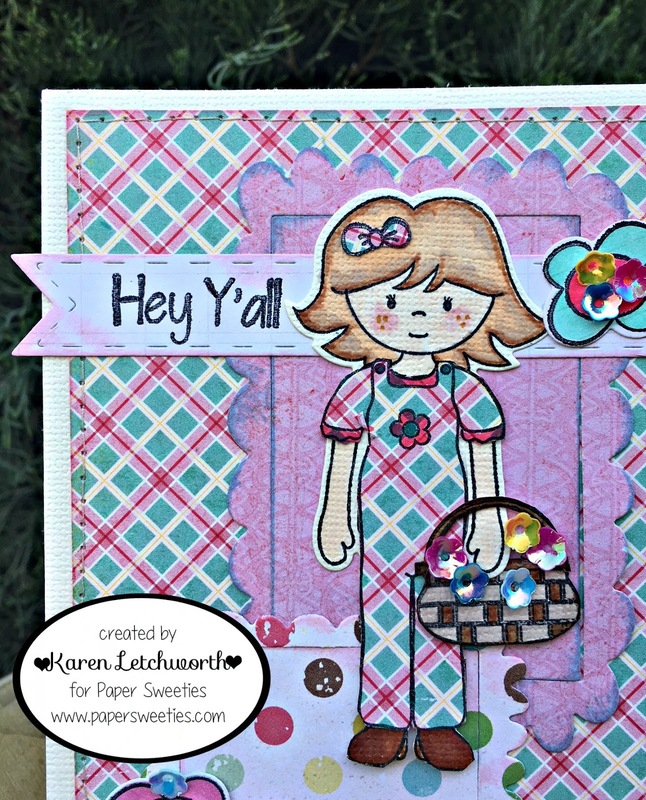 Her cute little pair of overalls was stamped onto patterned paper using the I Pick You Stamp Set as was her cute basket. I filled the basket with some of Paper Sweeties' ADORABLE flower-shaped Sequins including some Pink Grapefruit Sequins, Blue Raspberry Sequins, Cookie Dough Sequins, and Bubblegum Sequins. I also stamped two flowers using the A Friend Is Stamp Set and cut them with the coordinating A Friend Is Sweet Cut and placed more of the sweet Sequins on those flowers. My background was created by cutting two different sizes of rectangles from the Rectangle Scalloped Frames Sweet Cuts. And finally....I created my sentiment banner using the Sweet Borders Sweet Cuts, and the sentiment (Hey Y'all) is from the ADORABLE new sentiment set from the May Release called Hey Y'all Stamp Set (available tomorrow). Below is the complete list of all my talented teammates who have prepared a "Sneak Peek" to inspire you today. I hope you'll stop by their blogs to leave them some love, too. 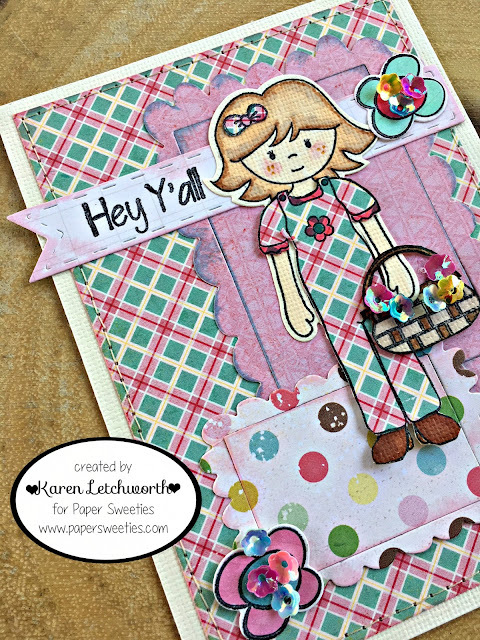 All of us at Paper Sweeties just ADORE these sweet stamps, sweet cuts, and ALL the goodies in this sweet shop; and we hope you will be inspired to purchase yourself some Paper Sweeties goodness of your very own! Simply click on the names below, and you'll be taken directly to the Paper Sweeties posts for today. Enjoy. 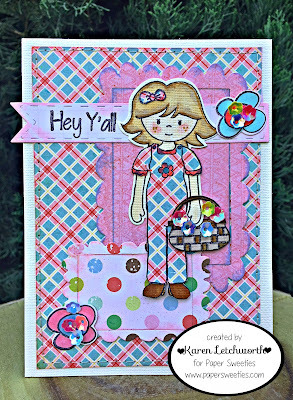 CropStop Challenge Blog - May Linky Party #39 - Anything Goes - I used lots of Tim Holtz Distress Inks, and Tombow Adhesive. Abigail is too cute in her outfit holding the basket! Wonderful design and beautiful papers!! What a sweet card! Love how Abigail's outfit is perfectly paper pieced to match the background! Thanks for linking up to Cropstop with this pretty card!